This past weekend my friend purchased a car adapter for his iPhone. We plugged the adapter into the cigarette lighter and expected big things. You know what happened? Nothing. I am not a car guy but my Hardy Boy mystery solving skills told me that the culprit was the car cigarette lighter. I knew how to fix the problem by reading that reliable glove compartment treasure we all turn to at least once in our lives - the car manual. The USDA Forest Service - like me - recognizes the brilliance of the owner's manual and created their own for trees. 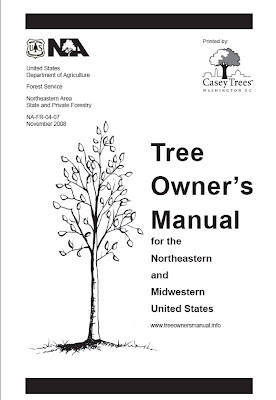 Just like an owner's manual that comes with a car or appliance, the Tree Owner's Manual for the Northeastern and Midwestern United States includes a parts list, instructions for installation, tips for troubleshooting common issues, recommended service, and more. Download it today and learn more about what your tree is telling you. I am sure all of you are eager to find out what was wrong with the car...it was the fuse. That pesky no. 33,15-amp fuse.